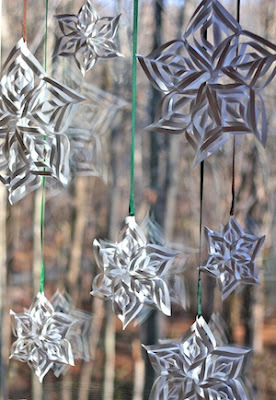 Years ago my mom taught me how to make paper snowflake stars. I have made many over the years, given many away but kept a fair number for me. When we added our sunroom with all its glorious windows I started hanging them in the windows. I love the look especially with the sun creating contrasts. The collection has grown and I now hang them in groups of 5-7. I make them in a variety of sizes but all from plain white copier paper. Inexpensive and effective. It takes awhile to make each one so if you want a collection like mine, consider having a party and teaching everyone how to make them. Tonight I got a special treat. I got to watch the moon rise through the stars. Day One of holiday home decorating is done! You'll learn I am of the group that decorates slowly through out the month. 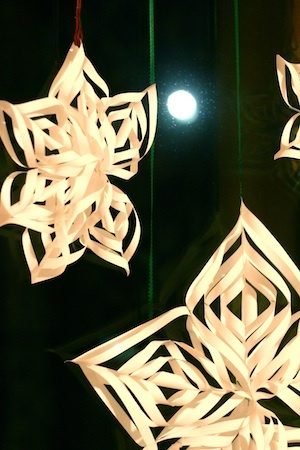 The holiday grows around us as the spirit grows within us. I am not going to do my own tutorial because there are many already posted. 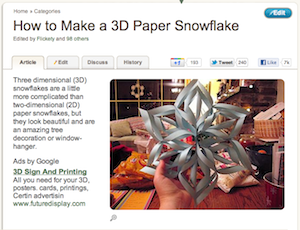 Here is a link to a great tutorial on wikihow. 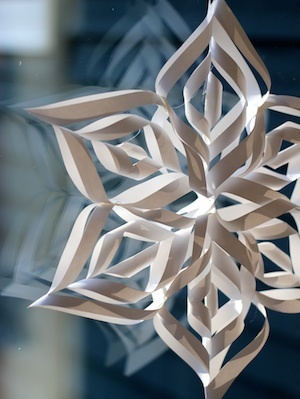 Check it out and make a windowful of snowflake stars for yourself.